Looking for home remedies for cold and cough in babies and kids? Struggling to find cough remedies for babies under 1 as you do not want to give antibiotics to your baby? Do you need gharelu nuskhe for cold or cold remedies for babies that really work? “I can’t bear to look at my son. It just hurts when I see the little chest heaving in pain due to cough, my poor little thing”. These were my colleague’s words when I asked about her son. I could imagine the plight she was going through. As the weather changed drastically in Mumbai, everyone including the babies are affected. It has brought on an onslaught of coughs, colds, fevers and what not. While most of the general population is affected, babies are the ones to have it rough. A cold is irritating as it can make you irritated! To top it all, those poor things can even tell you about their discomfort. So they resort to the only thing they know, cry. Older kids become fussy and cranky making you wonder if someone swapped your adorable darling with a changeling. I had to take a leave on Monday as my little Anshika was also affected by the change of weather. She was really cranky due to cold and cough. Now she is better and relieved. So that made me think, why not write a post about simple cold and cough home remedies for babies, toddlers and kids. These are tried and tested home remedies that have helped me. This post is about the 67 home remedies for cold and cough in babies, toddlers and kids. The cold and fever symptoms can be confusing for many parents. How do you know if it is a cold or a fever? While the symptoms look alike and can make you worried, it is easy to distinguish between the two. Fever symptoms are more severe. It can cause high temperature, throat infection, cough, body pain etc. Cold or fever, make sure you let your doctor prescribe the medicines for your child. Why do mommies turn to home remedies for tackling minor booboos and ouchies? The main reason – It is not made of harmless chemicals! I thought of diving the remedies according to the age groups so that it is easier for you. You see, not all the remedies are suitable for all the age groups. Disclaimer: Please note that though most of the remedies mentioned here are Ayurvedic, it could be possible your baby is allergic to certain ingredients used. Hence administering a few drops of these remedies for the kid initially could help to keep the allergy concerns at bay. Remember your baby’s first cold? I do, Anshika was barely 3 weeks old when she became down with her first cold and cough. I remember feeling really helpless as she struggled. At that age, they are already really delicate and any illness can make matters worse. I am sure many moms would have gone through this difficult phase of sleepless night and crankiness in babies during cold and cough. So let us take a look at some home remedies that can bring down their discomfort and ensure a fast recovery. Breast milk is a wonder drink. So babies under 6 months do not need any other medication other than breast milk during cold and cough to fight off the virus and bacteria. As you know breast milk is loaded with antibodies. These antibodies present in breast milk helps the baby’s body to build immunity against all types of germs, viruses and bacteria. It also helps to keep your little one properly hydrated. You can also read the benefits of breastfeeding you might know about. This has proven effective in my case and I almost nicknamed it my savior. It has helped in clearing her nose and prevents crusting. It also makes cleaning the nose way easier and comparatively tear free. I am sure your pediatrician would have prescribed pediatric saline drops for infants for your little one. Make sure you follow what your doctor or his prescription says. The general rule is to clean the nostrils gently and then to put the drops in. Keep the head tilted so that the medicine doesn’t flow out. You can make saline drops at home too. Take a steel bowl, spoon and sterilize it well. Take 1/2 tsp of salt and dissolve it in 8 tsp of warm filtered water. Once it has cooled, you can use it for your baby. But use it only in case of emergencies and I suggest to go for the saline drops available in the market than the home-made ones as there is a risk of bacterial growth. Garlic and Ajwain (carom seeds) are known for its anti-bacterial and anti-viral properties. So these two combined can prove to be pretty powerful and it makes a strong weapon against cold and congestion. But don’t let the name scare you, it is actually very easy to put together. You need 3 things to make this potli or pouch – garlic, carom seeds and a clean muslin cloth. Dry roast 2 big cloves of garlic and 1 tablespoon of ajwain on a tawa. Wait for it to cool and once cooled make it into a potli or tight pouch. You can do that with the help of a clean muslin cloth. Place this potli in the baby cot or cradle where baby sleeps. The garlicky ajwain smoke emanating from the potli will help the baby as it helps to open the blocked nose and provides relief from congestion. WORD OF CAUTION: Please do not keep the potli/ pouch near your baby to avoid the chances of him/her putting it into the mouth leading to choking. If placed too close by it can also become a breathing hazard. If you are worried about the safety, then you can also dry rub the potli under baby’s feet. This method is also effective. A fleshy perennial plant, widely found in South India called panikoorka is used for treating cough, fever, sore throat and congestion in babies. Known as Indian borage, patta ajwain, patthar choor, karpooravalli or navarayila, Its a natural anti pyretic and expectorant. The fleshy aromatic leaves are wilted on the stove top, cooled and then put on the baby’s forehead. The leaves dry up indicating the absorption of water relieving the baby from cough/congestion. Take about ¼ cup of mustard oil and heat it. Take one or two garlic cloves. Crush them lightly and then chop them up. Add them to the mustard oil. Wait for it turn brown, then remove it from the heat. Remember only till it turn brown, don’t let it burn. You can use this oil and massage the little one’s chest and soles of the feet. Make him or her wear socks. A pinch of carom seeds (ajwain) can also be added for better results. Add it while heating the oil. Like the garlic, don’t let it go black. Mustard oil, garlic and carom seeds have anti-bacterial and anti-viral properties. Apart from that mustard oil has a warming effect which helps with the congestion. It helps to give your baby a much needed relief. You can also read the step by step method to oil massage a baby. WORD OF CAUTION: Never allow the ingestion of oil by the baby as it might cause loose motions and other problems. No intake of oils or herbal medicines are encouraged for babies. We recommend nasobuddy nasal aspirator for your baby which is efficient in relieving the baby’s stuffed nose. You can read my review of the nasobuddy nasal aspirator and buy it by clicking the banner below. Take a few strands of kesar or saffron. Rub it on a stone pad to get the paste. Apply tilak or tikka on baby’s sole and forehead at night. Saffron tilak will help in absorption of the accumulated water in baby’s forehead. This is an age old remedy used by my mother. The tender green moringa or drumstick leaves are picked. Warm 1/2 cup of coconut oil in a heavy bottomed kadai and add a handful of moringa leaves. Once the leaves get wilted and you get the aroma of the wilted leaves, you can take the kadai off the stove. Use this as your baby’s hair oil during cold, cough and congestion. Baby’s clothing should be as such to protect the chest from cold. If it cold, then make sure you layer his clothing so as to keep him warm. If it is already hot ensure that he comfortably dressed and he/ she doesn’t feel too stuffy. While the usage of blanket may seem like the go to option for the night, it may not be a good idea. Your baby might end up drawing the sheet or blanket over his/her head. This can cause suffocation and put your baby at risk of SIDS or Sudden Infant Death Syndrome. You can dress your kiddo up in a onesie and make him or her wear a t-shirt on top. This can be effective if it is not cold outside. Remember, his or her comfort matters the most, so if you think he is feeling cranky feel free to modify his/ her outfit accordingly. However, remember to keep the chest covered. Keep baby’s and your hands sanitized thoroughly at regular intervals with antibacterial baby wipes or soap. If you are wondering how this helps or have someone in the family who says that they don’t believe in this, let me tell why it is important. This helps to prevent the spread of germs. You do not want to make the situation bad now do you? You will meet and interact with a lot of people during the course of the day and that means you will be exchanging a lot of bacteria and germs as well. During an illness, the body’s immune system aka the defense mechanism is not as strong – which means he or she is susceptible to other diseases. So at least till the time he /she is not in the pink of health, ensure you follow this practice. Try to keep your baby’s head in an elevated position when he or she sleeps. This helps to facilitate proper breathing. 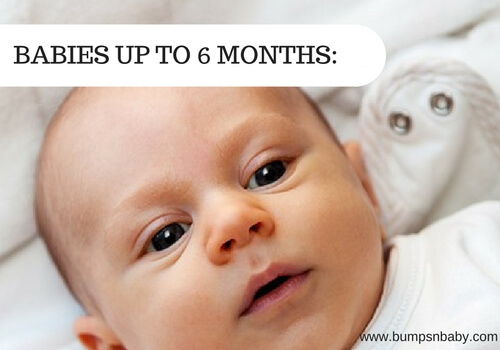 Also remove anything from his crib, cot or mattress that may affect his breathing. A bulb syringe can be used to remove the mucous that is blocking your child’s nasal passage. It can be a bit tricky to use as most kids do not like this being used. You can use this when the baby is sleeping so that it can be used effectively. Shop online for nasal bulb syringes now. A good humidifier can help to ease the dryness in the air and will help to make breathing easier when your child has a blocked nose. There are warm and cool mist humidifiers available in the market. 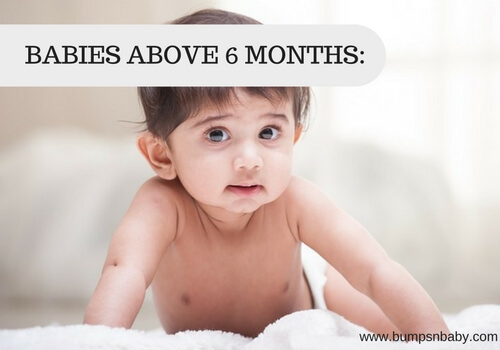 You can use breast milk, saline nasal drops, ajwain garlic potli for babies above 6 months too. Also stick to the rest of the points mentioned. Apart from those remedies you can also include these simple remedies to counter cold, cough and congestion. Steam the panikoorka leaves and extract its juice. Give 1/2 teaspoon to babies of 7 months and above. It is effective against cold and cough in babies. This remedy is known as unakka manjal chuttathu in Kerala. Place dried turmeric stick on the flame till its gets a slightly charred texture. Rub on a stone to get the turmeric paste. Apply the paste on the bridge of baby’s nose to get relief. WORD OF CAUTION: Please note not to smear the turmeric paste inside baby’s nose or suffocate the baby in any way. Mix turmeric powder with a little water to form paste. Take it in a ladle and heat it. Switch off once warm. Apply the luke warm turmeric paste on chest, forehead and feet. The heat from the turmeric can absorb the phlegm, thereby relieving the baby from cold and cough. Juice extracted from fresh carrots, diluted with boiled cooled water at room temperature can be given to babies of 6 months and above. It is found to be effective against cold and cough. Please make sure you have introduced carrots and your baby is not allergic to it before giving the juice. Warm mustard oil with a few kalonji seeds (nigella sativa) and 2 garlic cloves. Apply on baby’s chest, under the nose, back of feet and palms. Massage gently. You can wipe off the excess oil post massage. Give warm water at regular intervals to keep the baby well hydrated. Hydration is very important during any ailment. Your baby might be cranky and wouldn’t want to have anything but ensure you give him/her some warm water. You can try boiled ajwain or cumin water. Take a glass of water and add a small pinch of ajwain, carom or cumin/jeera to it. Wait for the water to boil. Cool the water and use it. If you are concerned about your baby having adequate amount of water, do read the article on water intake of babies. Warm mustard oil. Mix a teaspoon of sendha namak or rock salt to it. Massage this oil gently on the chest and back of your baby. Cover with a cotton cloth as this can provide warmth. Please make sure that the oil is not hot. Read whether it is safe to massage baby during cold and cough. Kada with ajwain or omam is excellent for cold and cough in babies. Take all the ingredients in a heavy bottomed vessel and boil for 10 minutes or the quantity reduces to 3/4th. Strain, cool and feed it to your baby. The dosage is 1 teaspoon twice a day after meals. If you are giving allopathic cough syrups, do not give this ajwain kada. Add some soups to his diet. Soups are excellent comfort foods during cold and cough. You can provide warm vegetable soup or tomato soup. You can try chicken soup if your baby is 8 months and above. These soups increase the immunity of the body. It will help ensure that their energy levels don’t dip too much and will help them fight the illness. You can refer to the 7 healthy soup recipes and 25 foods to tackle cold and cough in babies. No, you do not have to travel all the way to Nilgiri for nilgiri oil. It is also known as eucalyptus oil. It is extracted from the Eucalyptus tree and has a lot of uses. It is used for treating nicks and cuts, relieving respiratory issues, clearing the sinuses, providingrelief from allergies etc. It is also a expectorant and hence is used for cold relief too. You can take some cotton and dip it in some nilgiri oil. Placing it in the room where baby sleeps is found to be effective. You can also use a few drops in your diffuser, if you have one. You can buy nilgiri oil HERE. You can try steaming the room using a vaporizer or giving a warm shower. This is beneficial in providing symptomatic relief as the steam helps to loosen the phlegm and clear the nose. 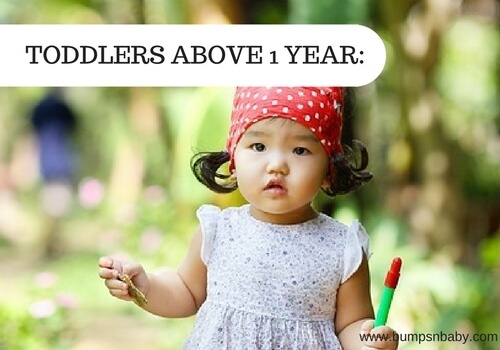 It eventually makes it easier for your little one to breathe. NOTE: Steam should not placed close to the baby as it can cause scalding. The garlic and ajwain potli in step 3, can be used to rub on the baby’s chest. It has to warmed up first. You can do this by using a tawa, place the potli on a warm tawa don’t wait for it to become too hot though. This medicated potli helps by clearing the chest. So bye bye congestion and phlegm! NOTE: Don’t apply the potli on the chest directly from the tawa! Always do a temperature check prior to application. You can place it on your palm or the inside of your wrist, check for the temperature and rub it on with the slight heat. If it feels too hot, wait for it to cool down. If you can’t feel any heat, then you need to re-heat it. Babies have really sensitive skin and so you have to extra cautious. The skin on our palm and inner wrist is delicate compared to the rest of our body. So the temperature you feel is the closest to what your baby will feel. This way you can be sure that it won’t burn your baby or cause any discomfort. Tomato and garlic soup also called rasam can be given to babies of 7 months and above. This is popular in South India as a common cure for cold and cough. The ingredients help in kicking the immune system back on track and helps the little ones get well soon. The bonus is that it tastes yummy! A welcome change from the bland fare we give them during any illness. Please omit the red chillies or chilly powder here. You can read the easy and lip smacking rasam recipe for babies and kids. Boil 1 cup of water with a pinch of ajwain and 1 teaspoon of jaggery. Strain, cool and give it to your baby. The dosage is 1 teaspoon once a day. Apply vapo rub for babies under the feet and put on cotton socks before sleep. How does it help? Truth be told, I don’t know. It could be due to the menthol or camphor in it. But many moms and grand moms swear by this remedy. It is like a wonder remedy. It helps to soothe the baby and provides him/ her with an undisturbed sleep. It works for cough too. Always be a bit careful when you apply it on older kids feet as it can be slippery. If they have to wake up to use the washroom, ensure that you see that they are careful and walk slowly. Boil 1 cup of water with 1 teaspoon fennel seeds and a pinch of ajwain seeds. Cool, strain and feed your baby. The dosage is 2 teaspoons a day morning and night. All the above methods till no: 29 can be used for babies of 9 months and above too. Apart from that, the following can be used too. Yes! The very humble green lady’s finger can help baby get rid of cold and cough. Boil the finely chopped lady’s finger with water for 10 minutes. Strain, cool and give it as a soup. This concoction is effective for cold, cough and sore throat in babies. Restrict the dosage of 1-2 teaspoons to once a day as jaggery is hot by nature. Boil all the ingredients in water for 10 minutes. Strain, cool and feed to your baby. Warm 1/2 cup of coconut oil with 1 pearl onion, 2 to 3 tulsi leaves and 1 betel stem. Once switched off, add a pinch of camphor to it. Apply this oil on baby’s chest, neck, back bone and under arms. Note: Do not exceed the amount of camphor as its too strong and pungent in nature. Warm coconut oil. Add a pinch of camphor to the oil after taking from the stove. Use it to massage your baby. If you have access to Kerala Ayurvedic stores, stock up a bottle of karpooradi thailam from there. Use the thailam to massage your baby or kid when contracted with cold, cough and congestion. For babies above one year you can follow the remedies mentioned above. Apart from that you can also use the following remedies. Does your little one get up frequently at night unable to sleep due to the persistent cough. Let him have a lick of 1 teaspoon plain honey. It helps to soothe his irritated throat. White onion also known as ‘safedh kanda’ is available in North India during the months of April-May. Its known for its medicinal benefits. Extract the juice of the white onion and offer 1 teaspoon to your toddler. It helps to relieve him of cold, cough and congestion. Grate ginger and add honey to it. A teaspoon of this can be given at regular intervals. It helps to soothe the throat, respiratory tract and provides relief from cough. You can also read the 10 ways to use ginger for cold and cough in babies. Add lemon juice and honey. Add a little warm water to it and give it your baby to drink. This is yet another favorite because kids make a face at medicines, but when it comes to yummy drinks, they don’t say no. So this is a remedy that doesn’t face any resistance from their side as it does not taste like a medicine at all. Moms don’t complain either, it helps them in fighting the cold and cough, keeps them hydrated and also provides them with energy. Remember the times when your daadi or grandma used to give you ‘haldi doodh’ when you were down with cold or cough? Milk with turmeric also known as ‘haldi doodh’ is something most of us are familiar with. It is famous remedy and is very effective for dry coughs. It is made by boiling a glass of water with a pinch of turmeric. You can add powdered palm jaggery for sweetness. Turmeric is known for its medicinal qualities and it helps to fight the illness and provide fast relief. The warm milk will also help in providing your baby with a nice and uninterrupted sleep. I know what you are thinking, coffee for a small kid?. Well though this is called coffee, you can make it without using coffee powder. Boil water with all the ingredients mentioned. Strain and give this concoction for quick relief from cold and cough. This may feel a bit fiery but it is absolutely effective against even the toughest of colds. Each and every ingredient in this drink is known for its abilities to fight cold and cough. Dry ginger coffee or chukku kaapi is widely used in South India as an effective remedy for cold and cough. Crush dry ginger and pepper corn roughly. Tear tulsi leaves and keep aside. Boil water with jaggery and let it dissolve. Add dry ginger and pepper corns followed by tulsi leaves. Once the leaves get wilted, switch off the gas. Sieve and feed your baby luke warm. You can also refer to the 3 ways in which dry ginger can be used to treat cold and cough in toddlers. Crush both ginger and tulsi to extract the juice. Add honey and give to your toddler. Now this is a remedy that may have you wondering, cloves for cold? Let me tell you, it works! It is an expectorant and helps in getting rid that phlegm. It is also beneficial in keeping that cough in check and also provides a sound sleep. Dry roast 5 cloves and grind it well once cooled. Add honey to it and give it before sleep. Boil 1 cup of water with 5 tulsi leaves, 1/2 inch ginger and 2 pepper pods. Strain, cool and let your toddler drink it. Honey is an anti-inflammatory, anti-bacterial and anti-fungal agent. Take a small clove of garlic, crush it, add some honey and make a paste. Give it once or twice a day. The allicin in garlic is an anti-microbial and anti-viral and anti-biotic. It helps to expel the phlegm and reduce chest congestion. Babies aren’t fans of the garlicky taste but the honey helps to sweeten the deal. You can also add garlic to their food. Boil water with tulsi leaves, betel leaves, pepper and ajwain. Once cooled, strain and add honey. Grind both cumin seeds and sugar candy to a fine powder. Offer this to your kid whenever he coughs. Finely powder cumin seeds, dry ginger and sugar candy. Store in an air tight container. Use it for your toddler’s persistent cold and cough. Warm water with a few ginger slices. Add honey to it when it turns luke warm. Let your kid drink this infused water. Take a teaspoon of honey and add a pinch of cinnamon powder. Offer this to your child during bouts of cold and cough. Adathoda or adulza is a medicinal plant widely used in Siddha medicine. Make the kada of adulza leaves along with jaggery or honey. Take a teaspoon of ghee and add a pinch of freshly ground pepper powder. Delicious in taste, it is a sure shot winner against cold and cough too. Kacchiya enna or heated hair oil when used during cold and cough, helps to decongest the baby naturally. The ingredients are tulsi leaves, drum stick leaves, coconut oil etc. Kesar milk also known as saffron milk is excellent during cold and cough in toddlers. Add a few strands of saffron to 1 cup of boiled milk. Let it cool, strain out the saffron threads and offer to your kid before sleeping at night. Make a concoction of lemon juice, cinnamon powder and honey. It is excellent for fighting the cold and cough virus. Dry roast dry ginger and long pepper separately. Grind to a fine powder. Add palm jaggery or honey to the mix and use it as ready made cough syrup. Boil milk with a pinch of ajwain and give it to the child at the onset of cold symptoms. All the home remedies mentioned above can be used here. The jaggery and peppercorn mix is proven to be an effective expectorant. With the phlegm out, the chest congestion will come down and so will the cough. Pound jaggery and peppercorns to a fine powder and store it in an air tight container. Let your kid have a pinch or two whenever he or she gets a cough. Don’t worry about the heat, the jaggery will help mask that. Crush ginger or cut it into fine juliens. Add salt to it. Offer this to your toddler to get rid of sore throat, cold and cough. Mix turmeric powder, ghee and jaggery powder to form small balls. Let your child savor as and when he gets a cold, cough or sore throat. 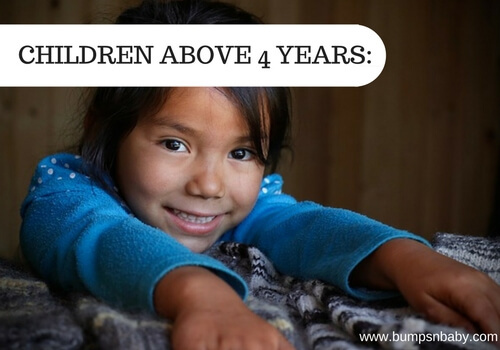 For kids above 4 years, you can use the remedies mentioned above for relief from cold and cough. Pour 2 drops of eucalyptus oil or nilgiri oil in a pot of steaming boiled water. You can also add a few tulsi leaves to the water. You can also use an electric machine for steam inhalation. Ask the child to bend and cover his head with a blanket that facilitates breathing and inhale the medicated vapors. This helps to unblock the nasal tract and also loosen the phlegm. It helps the child to breathe easy and also facilitates the loosening of phlegm. This can then be spit out by the child. Do not try this with smaller kids as they can burn themselves. Also coming to close to the steam can lead to scalding. Make sure the pot you are using doesn’t topple over. Keep it secure to avoid accidents. Also caution your child about the dangers of touching hot objects and going close to steam. Gargle with honey, lime and warm water which helps to clear off the throat and nose. This can’t be done by younger kids. But for kids above 4, this can be done and it works wonders. Apart from clearing the throat and nose, it also helps in providing relief, especially if your little one has a bad scratchy cough. You can buy pure honey from HERE. If you child is rejecting every homemade syrup that you offered, try this. Make a desi masala chai at home with healing spices like ginger, cardamom, pepper, mulethi etc. Offer this to your kid. This tea can fight cold and cough virus thanks to the anti-bacterial and anti inflammatory properties of the spices added. Let your kid gargle with salted warm water. Helps to soothe the throat infection and cough. We add a natural anti septic twist to the plain old salt water gargle. Add a pinch of turmeric powder and then ask your kid to gargle with it. The best part about this homemade cough mix powder is that you can make and keep it in an airtight container. This can be very handy in case of emergencies while travelling with your kids. When your child is affected by a bad cough ask him/her to take a small pinch of this powder for instant relief. Always make a fresh batch to retain the freshness. Neti pot is a small pot with a long, thin and straight spout. It is used for sinus relief. The reason why I have added this in the category for older kids is because it is tricky to use if the kid isn’t co-operative. How to use netipot for kids? To use this, you have to take distilled / boiled and cooled water in the pot. Now let the child lean over a sink with his/ her titled sideways. This is so that the water drains out properly. Now insert the spout into one nostril. It should be inserted properly so as to not let the water flow out of the same nostril. The mouth should remain open and ask the child to be calm and to breathe through the nose. Start to pour gently. Soon the water will start flowing out of the other nostril. Once the flow has stopped, ask the child to stand straight. Ask him/her to gently blow the nose. Use only boiled and cooled water or distilled water so as to prevent infections. Try this on yourself first before you ask your child to try. Do not force your child to do this. If your baby’s cold and cough persists for more than 2 weeks, please consult a pediatrician immediately. It might not be just a normal cold and cough that you think it is. It could be a serious infection that requires a doctor’s intervention. Please don’t try any home remedies which involves intake of any oil / herb/ medicines for babies below 6 months. They will do more harm than good. Make sure babies get 18 hours, toddlers and kids minimum of 8 hours of sleep to get enough rest during cold and cough. Make sure you follow all the precautions mentioned in this post, while using these home remedies. Do not use honey for children under a year old. This is because it could cause a rare and dangerous form of disorder called Infant botulism. This happens when the spores of clostridium botulinum enters the body and produces a toxin. Honey is a food item where this spore could be found. This is why honey is not given to kids under one. Kids above 1 year can have honey as their immune system is stronger and better developed. Encourage toddlers and kids to use handkerchief and wash their kids hands at regular intervals to avoid infection. If you are using any ingredient for the first time, make sure you check if you child is allergic to that or not. Hope this helps. You can also read about the 5 tricks to keep cold at bay. I am sure there would be many more home remedies for cold and cough in babies and kids. Please share with me in comments. Previous ArticleHow to Get Rid of White Spots on the Face of Babies and Kids? My baby is about 4 months (3 months 28 days ) suffering cold & coughing too much. She has no fever. I have consulted with 3 pediatric. They just advised ambrox drop 15 drops 3 times & solo nasal drop. another doctor added brodil 1 ml 3 times. My baby is still coughing too badly. We are really worried about our baby. Which type of treatment we can apply as she is suffering it from a week till. I would like to get home remedies for adenoid growth in children. My child is 8 years old. She is snoring while sleeping and she has a blocked nose most of the times. I consulted an ENT and the X-ray of my child showed enlarged adenoids. So the Doctor suggested to remove the adenoid gland.I don’t want to go for a surgery. So can you please suggest any home remedies? Do she need to remove the gland or will it shrink as she grows ? You must go for punchgavya therapy. It is the most safe and most effective option. For this, you simply put 1-2 drop of punchgavya ghee into her nose before going to bed. And you will see incredible improvement within a week. Although some cautions are there like not drinking water until 1hr. If punchgavya ghee is not available, you can go for Desi ghee (indigenous Indian cow breed). Turmeric powder with milk and honey is also a great home remedy to relieve bad cough. Not only is great in certain recipes, but its properties contain disease preventive agents because of its anti-inflammatory ingredients. It is an antiseptic, an anti-flatulent, a blood purifier, a carminative, and a great cough expectorant. Hi Sangeetha, My baby is 7 months. She usually has cold, fever and chest congestion. Being alone at home I am usually confused and blank. Also now that she is 7 months. I am not sure what I have to feed her resulting in her having only lactogen and cerelac. 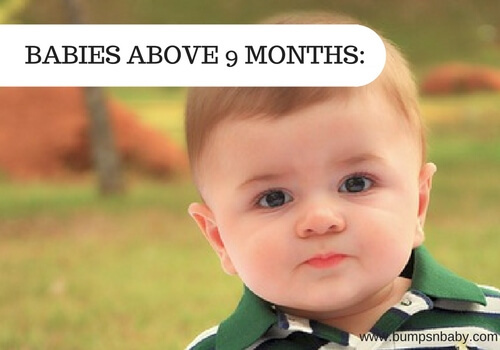 Please can you advise…..
my baby is just 8 months old. he is suffering from cold. I am giving him a medicine named Tus Q p since 2 weeks. His nose also becoming red. In spite that he is not getting relief. so will you please provide me a suggestion for this. my kid is 5.5 yrs old. since last yr he is suffering from dry cough with chest conjection & doctor nebulizing him even in summer also. I also giving him ginger, honey & tulsi but cough is same. hi sangeetha mam, i’m nirmala and i want to know how to tackle the problem of making my 2 years old son to eat meals whatever prepared at home. My daughter is 2yrs and 10 month old.from past few days she continuously cough at night . can you please recommend something which might be helpful for her . Give warm soups for him, you can search for the recipes in the blog. All are effective for fighting cold and cough. Hope this helps. hi my baby is 3.5 yrs old and shifted to dubai before one and half month before. nearly one and half months she is suffering from cold and cough with runny nose. she is refusing to take food drinks etc.. i tried honey and ginger. but no use still its der. can u pls suggest any best idea for this? 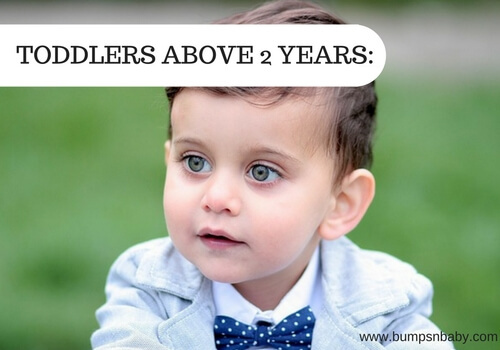 i m trying with doctor also…..
Hello Mam, my son is now 11 months old and he is having wet cough and runny nose, pls suggest me some home remedies. Komal, use garlic ajwain potli, use steamer for his blocked nose placed at a safe distance and give him warm soups. Pls suggest what should i do, already giving him ginger and honey, warm water with salt and pepper. but he is not having relief..
Durga, yes you can bathe her. Make sure she is given bath in luke warm water. The steam can help to unblock her nose too. Let her sleep on her sides so taht she can breathe. Give her mild vegetable soup and rub ajwain potli on her sole of feet and chest. You can also use garlic in the potli. Hope this helps. Dear Sangeeta ji, my son is 5 year old.He is suffering from cold cough & throat sore please suggest me some home remedy. Other than that give him honey with ginger juice in it, warm chicken soups and boiled water with ginger. He will be all fine. My baby is 10days old and having runny nose and cough. She is having trouble in sleeping and taking feed. I have tried saline water which helps for short term for runny nose but I am feeling helpless by seeing such a small baby coughing so much. I will be trying ajwain potli, any other suggestions. Breast milk is the only option for babies less than 6 months old as they are very much sensitive. If she is finding it too difficult, take her to the doctor and take the medicines. Do not try home remedies for babies of 3 months. hello…my baby is 8.5 months old . he is suffering from cold and caugh from last one week. have been trying alopathy medicines but no use. can u please suggest some effective home remedies for cold and caugh. Use saline drops and ajwain water to drink. You can also steam the room to loosen the mucus in his nose. Keep giving soups and warm foods. When sleeping , make sure his head is elevated or he sleeps sidewise. My baby is 1 year old from last 2 days before he facing cough problem .If I try the honey &ginger mixer immediate he feel free .If no how long I need to try same ,.suggest me which comes honey need to buy for this..
Honey and ginger will definitely have effects. You can give him everyday till he feels free from cough n cold. You can use any brand honey for your little one. Replace the regular drinking water with ginger water, it helps too. What is the cause of stomach ache? I think since she has infection it could be cause of the food she consumed and the body is trying to get rid of it by having loose motions. Make her drink curd/buttermilk with hing at afternoon and coconut water at regular intervals to keep up the hydration levels. Let her eat curd rice or pomegranate kernels, it can help too. Let her eat what she wants to except fried and masala foods till her loose motions stop. If it continues even after a week, pls get her to a doctor. hi .i just read your home remendy .can u tell me please how to stop a night cought is really bad .my girl is 4 year .she is got a astma as well .i want to try home remendy please can u tell me? Is she taking any meds for asthma? Ask the doc for medicines for this cough too. Poor thing she is suffering every night isnt? Hi Sangeetha, just few days back I joined this blog and I found very useful tips on various topics for babies n kids. My son has just completed one year. He has only one tooth now, can you please suggest morning breakfast which is easy and quick to prepare and suitable for him. Thanks in advance. And yeah dont under estimate the single toothed baby, his gums are strong enough to grind anything 🙂 Yes obviously adult supervision is required to prevent choking though. How old is your kiddo ? Crush 2 pods of pepper and 1/2 a solid jaggery into a fine powder. Give this powder to your baby thrice a day. Will help in clearing the phlegm and soothes nasal tract too. how to avoid throat infection n any home remedies? How old is your baby Reshma ? i was late to read this.very very informative.